If you love the blues, you've sold a little of your soul to the bottle or the devil and some nights they're the same damn thing. And even if your hands on the Good Book and lips have never tasted whiskey, you know that desire, that lust, when you hear the first licks of the guitar. 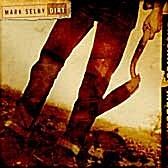 Dirt, Mark Selby's sophomore release is guitar rock with that same blues seeping from every note. Opening with the driving power of "Reason Enough," Selby sets in motion an album that in it's softest moments is a touchingly honest confession on life love and regret , with songs like "Back Door To My Heart" and "You." On its harder side this album kicks in the door and knocks the crap out of you, proving Selby he can play songs as well as he writes them. The track "Moon Over My Shoulder" even has Selby sounding like a young Ray Charles. If you like Blues, If you like Rock, If you just like good music without labels , this is a Great CD to pick up.